August 28/29, 1944: In order to give the enemy no rest and to continue the softening up process, the Group was ordered to attack the troop concentrations in the Pesaro area for a third consecutive night. (MacIsaac was given a night off on the second of these three attacks). Forty eight 205 Group aircraft were ordered to destroy enemy troops, equipment and supplies in the same area as specified on the night of August 26/27, but this time in a "blitz attack" from 2110 to 2113 hours. MacIsaac left Tortorella in Wellington LN798 - "D" at 1929 hours carrying seven 500 and seven 250 pound bombs. The weather was good. Flack over the target area in the form of heavy and light caliber Flak guns was accurate and intense. No enemy fighter activity was observed. Aiming point photo taken by F/Sgt. Macisaac over Pesaro. Anti Aircraft tracer fire surrounds the harbor, and two 250 pound bombs can been seen falling from the aircraft. 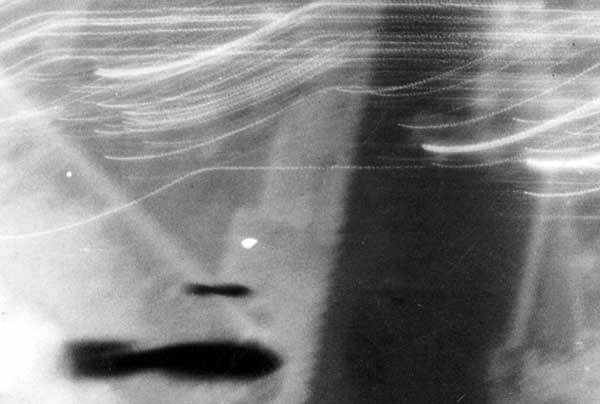 A third bomb, just beginning to explode, can be seen just above the two falling bombs as a white point of light. Flight Sergeant MacIsaac bombed on the center of the harbor installation, dropping three "sticks" in the target area from 6300 feet on a heading of 285 degrees at 2112 hours. He reported seeing bursts across the harbor area. Sgt. Ockenden in Wellington MFH72 also reported seeing MacIsaacs bombs straddle the harbor in good concentration with multiple bursts observed. A total of seven aircraft from 37 Squadron operated, dropping forty nine 500 pound bombs, forty nine 250 pound bombs and seventy packets of nickels from 5800 to 6800 feet at 2110 to 2112½ hours. Six photos were plotted, five in the correct area. Large bursts were seen across the harbor area and across buildings near Highway 16. 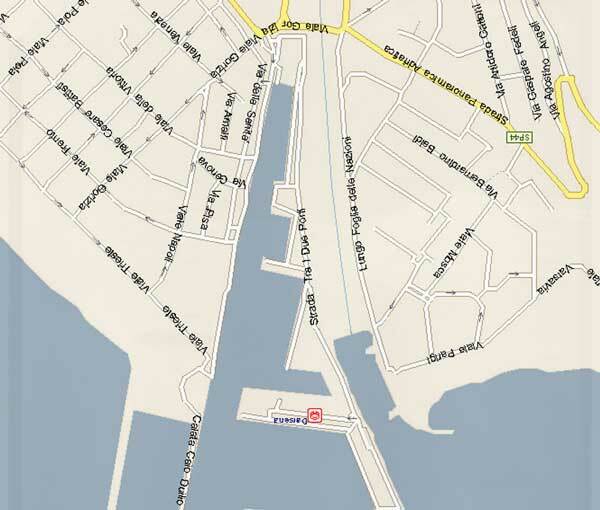 Present day map of the area shown in MacIsaacs aiming point photo of Pesaro. Detail of falling bombs and flak tracer over Pesaro - August 28/29, 1944. 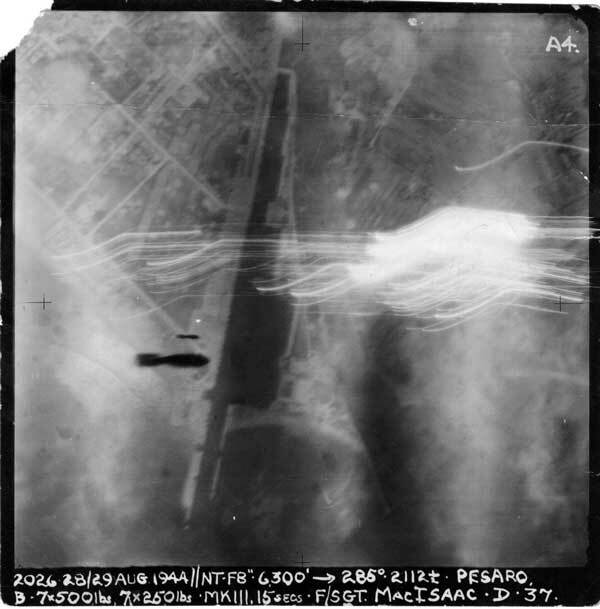 A special nickeling mission on a line from Campi to Pisa was carried out by F/Sgt. Schlete. This was carried out successfully, leaflets being dropped from 10,000 feet at 2132 to 2150 hours. Two-thirds of the nickels were dropped along latitude 43.50 north and one-third upon Pisa. F/Sgt. MacIsaac returned to Tortorella airbase at 2242 hours. There were no losses on this raid, however, two 205 Group aircraft detailed to mine the Danube on the nights of the Pesaro missions failed to return with all crew lost.